Eleanor Cutri Smeal (b. 1939) was raised in Erie, PA. She graduated Phi Beta Kappa from Duke University (1961) and received a master’s degree in political science and public administration from the University of Florida. She married Charles Smeal in 1963; the Smeal family moved to Pittsburgh in 1967. Ms. Smeal joined the Greater Pittsburgh Area chapter of NOW in 1970. She promoted a multi-chapter structure for the Pittsburgh area and founded South Hills NOW in 1972 to reach out to suburban housewives like herself. While lobbying for the Pennsylvania Equal Rights Amendment, she concluded that state chapters would be an important vehicle to advocate for laws to promote equal rights for women and girls. In 1973, she co-founded and served as president of Pennsylvania NOW, the first state chapter, and played a major role in having the state’s equal rights statute applied to interscholastic sports. Ms. Smeal was elected to the NOW board in 1974 and to two terms as president (1977-1982). She is most well known for her leadership in the fight to pass the Equal Rights Amendment (ERA). With the allotted time for ratification running out, Ms. Smeal announced an ERA “State of Emergency,” a call for NOW to devote itself entirely to passage of the ERA. They won an extension of the deadline for ratification, but were unable to garner the votes to pass the ERA in the three states needed to ratify the Amendment. Ms. Smeal’s 1984 book How and Why Women Will Elect the Next President accurately predicted that, because of a “gender gap” in voting behavior, women would ultimately determine the outcome of the presidential election. 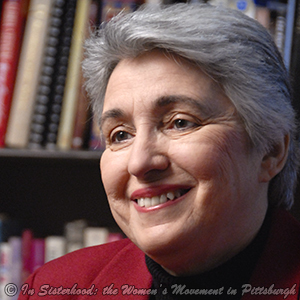 During her third term as NOW president (1985-1987), Ms. Smeal led the first national abortion rights march that drew more than 100,000 activists to Washington, D.C.
After leaving NOW, Ms. Smeal founded the Feminist Majority Foundation (FMF) and has served as CEO (1987-present). Inspiration for the organizations name came from a Newsweek/Gallup public opinion poll that revealed that the majority of women (56%) in the United States self-identify as feminists. FMF uses research and action to empower women economically, socially and politically.